Gris clair... is a popular perfume by Serge Lutens for women and men and was released in 2006. The scent is woody-floral. The longevity is above-average. It is still in production. Got gris clair a few days ago... for testing. First I smell cool lavender, later violets and incense open... It looks kind of familiar. First I sniffed some sweaters from my husband, then I thought I'd check them out at Parfumo. On the way to the PC I see the ironing board and suddenly I realize - Gris clair... smells like freshly ironed laundry! A few moments later iris and tonka bean become louder - the "freshly ironed laundry" now smells sweet. Gris Clair is of course not a Rock'n'Roller and "too old" basically not, if you look at the year of publication 2006, but maybe perfume years count similar to dog years x7. "Too old" stands here as a metaphor for Gris Clair's boundless seriousness, which is not softened by any [at least winking] counterpoint and nips in the bud any thought of lightness and carefreeness [Rock'n Roll] Gris Clair reminds me of a person who in the last stage of his life mourns a carefree childhood and youth that he never had. He also lacks true warmth of heart, which he deeply regrets. The warmth that some of my esteemed pre-commentators, Gris Clair, concede to me is merely an alleged, pretended, comparable to a fireplace on an LED screen. As I also feel all scents in the interaction strangely artificial. If there is a really suitable season for Gris Clair at all, then it is without doubt autumn, rather winter. However, one will not find comfort in this fragrance. Gris Clair is for me in the last consequence - and there I will reap surely contradiction - a well-composed concept smell, more concept than some other smells, which take up this label for themselves offensively. The surprising end of Gris Clair is nevertheless really regrettable - "too young to die" - but maybe Gris Clair had become too serious a scent for a too serious time from the point of view of his creators. But maybe one day we will see Gris Clair again, a bit more youthful, a bit more friendly and a bit more optimistic, which would close the circle to the "Story behind" of Jethro Tull's album "Too Old to Rock 'n' Roll, too Young to Die". My review of Gris Clair... by Serge Lutens as a YouTube video. Lavender is completely in the center and it smells pretty much like a lavender scented bag. "The sky above the port was the color of a television set on a dead channel." William Gibson, neuromancer, 1984. Cyberpunk the first; console cowboys wander through the neon-lit street canyons of Night City, the rain falls, in Sprawl everyone is next to themselves. Gris Clair, a fragrance from cyberspace. Grey lavender, digital austerity, a wistfully beautiful aura. The sweetness is hard on the border, painful and pleasurable. Texture and feel are dusty and dry. Even if the sweet spiciness might suggest warmth, the surface remains hard and impenetrable. An incense veil floats through the picture, one could probably speak of a simulacrum, but these categories would be the wrong ones anyway. Lavender or the idea of lavender? All in all, everything remains intangible, the perfume is from beginning to end a homogeneous, densely woven space without the recognizably separated juxtaposition of possible notes. Clear, calm and unapproachable, it floats around and yet its sweetness has that siren-like pulling effect that lets you plug into the consensus hallucination of the Matrix again and again. The bodiless pleasures of cyberspace. A good fragrance. "Cold steel smell. Ice was hugging his spine. And faces peered in from a neon forest, sailors and crooks and whores under a poisonous silver sky..."
I love lavender: in the garden, in the flowerpot on the dining table, in bath oils and in perfumes - the only thing I shy away from is lavender in the wardrobe, because I don't want the perfumes I wear to be distorted by another fragrance. In search of the lavender scent of my heart, I have tested much: Thank you, Yatagan, for the helpful statements, comments and the incomprehensible lavender list!!! "Gris Clair" came to me as a rehearsal and at the beginning I was very sceptical, because I am simply overwhelmed with many scents of Serge Lutens. Too spicy, too room-filling, too many smells fighting for supremacy, too much of everything for me. And even "Gris Clair" wasn't love at first sight. The beginning is still quite overwhelming for me. Lavender in abundance, but at the same time also herbaceous-spicy, a trace in the direction of "Wild Lavender" from Villoresi. The association was so deterrent that the rehearsal went unnoticed for some time. But one evening, when I had trouble falling asleep, I thought again of "Gris Clair" and supplied the back of my hand with a powerful sprayer. Not parked too close to the nose, it emanated a wonderful, dark purple lavender cloud that gently enveloped me. And although I could not fall asleep for a long time, it was still pure aromatherapy. The lavender field is almost imperceptibly enriched by further components. Surprisingly, it is the incense that inspires me most and that I clearly smell, because it is actually a smell that I don't usually appreciate in perfumes. "Gris Clair" succeeds in something astonishing: it increasingly changes into a powdery direction and at the same time changes its character, as if a sudden veil of mist were to stretch over the lavender field. Also overwhelmingly beautiful, but not gloomy or even musty, but rather completely relaxed and confident. Nevertheless, it clearly remains a lavender scent, which additionally shows woody, soft or even smoky-spicy facets, but which never lead too far away from the main theme. Normally I associate lavender with rather simple linear scents, which are sometimes not very elegant, but "Gris Clair" is for me absolutely. Together with "Pour Un Homme de Caron L'Eau" by Caron, which I prefer to use as a summer fragrance, "Gris Clair" is currently my lavender favourite. Since the fragrance is no longer produced, you can get cheap offers online at the moment - and I took the opportunity to quickly add a bottle to my collection! The Hilliard Ensemble is a British group of singers specializing in the interpretation vocal compositions from the Renaissance to the Baroque period. As I'm writing this review, I'm listening to their rendition of Johannes Ockeghem's “Requiem” and “Missa ´Mi-mi´”. The Ensemble's interpretation is divine: incredibly soft, pure, meditative, ideal for a quiet winter evening spent by the fireplace, preferably with a glass of mulled wine to lift one's spirits a bit higher. I started this review by mentioning the Hilliard Ensemble because lately I've been trying to match various musical compositions and styles with appropriate fragrances. I once sprayed on Serge Lutens' “Gris Clair...” while listening to the aforementioned CD, and was amazed at how effortlessly the music and the scent complemented each other. “Gris Clair...” is a melodious interplay between two notes, namely lavender and tonka bean. Thanks to the lavender, the head of the perfume is markedly herbal and aromatic. The lavender note provides a generous amount freshness to the perfume, evoking the feeling of genuine joy. Gradually, the herbal character of “Gris Clair...” is toned down and substituted by the spicy sweetness of tonka bean. The initial feeling of joy is transformed into nostalgia, meditation, even a longing for the unattainable. Lurking somewhere in the shadows of the fragrance's two stars is iris, so delicate it's barely perceptible to my nose. Due to its straightforward, aromatic freshness in its opening, “Gris Clair...” initially displays a different character to the other perfumes I've sampled from the Serge Lutens line thus far. Simultaneously, it is firmly embedded in Lutens' olfactory philosophy owing to its emphasis on the quality of raw materials, substance and the belief in the artistic value of perfumery. “Gris Clair...” might never become the most celebrated Lutens fragrance, but it surely is, just like medieval polyphony in music, one of his most comforting ones. Great lavender opening but dries down to a sweet powder. Actually i feel disappointed with Gris Clair... i did expect more from a Lutens. It's more suitable for a woman in my opinion. Sillage, lasting power and projection are weak. Lavender and I are not the closest of friends when it comes to perfume. For some reason the note often strikes me as harsh and sharp. My favorite lavender scents have been smoothed out, but even the best of the best I consider for the most part to be aromatherapeutic inducements to sleep. I also bathe HRH Emperor Oliver in lavender bubbles because it seems to calm his nerves. 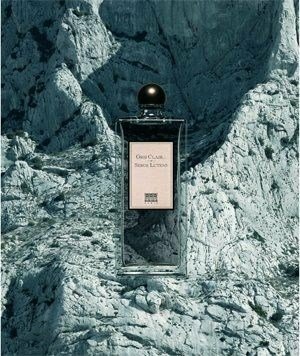 Given my attitude toward lavender, it might seem that I would not take very well to Serge Lutens GRIS CLAIR, which opens with a pretty powerful blast of an ink-like dark purple lavender. It's strong enough to evoke vague memories of the essential oil concoction offerings from the house of Lush. Fortunately this composition is not intense and caustic as are some of those--I don't feel my nasal passages burning! A rich iris note comes forth with more force as the perfume dries down, but the lavender in GRIS CLAIR really covers everything up in the opening, and remains dominant throughout the duration of a wear. After the somewhat strong, almost lavender-oil opening, GRIS CLAIR swiftly settles down to a smooth ambergris lavender layer. I thought initially that the base was musk, but apparently it is ambergris. In any case, the texture coheres with my concept of ambergris: similar to a supple metal mesh. While wearing this creation earlier today, I thought of Gandini LAVANDA ED AMBRA ORO, so I decided to compare them side-by-side. Despite the vast differences in the other notes listed in the official hierarchies of these two creations, the lavender and the amber are dominant in both. Where GRIS CLAIR features "old wood", LAVANDA ED AMBRA ORO features patchouli. They are closely enough related compositions that anyone who likes GRIS CLAIR would probably like LAVANDA ED AMBRA ORO, and vice versa. GRIS CLAIR is better, I believe. There is something appealing about this rich layer of ambergris and lavender embellished with iris, and I understand why so many people love this composition. For me, the inky lavender is a bit too strong, but GRIS CLAIR is nonetheless more appealing to me than some of the other perfumes from this house. It's definitely one of the best lavender perfumes I come across in recent times. I'll go somewhat against the grain in saying that the clean lavender opening of Gris Clair is the best part of the scent, IMO. It is a refreshing menthol mixed with a nice natural lavender that led me to think for a moment that Gris Clair was a rare exception to my "no lavender scents" rule. Unfortunately the top notes disappear in seconds, and then a powdery iris note (another note I can't stand) appears in full force and mixes with the lavender making the scent near "scrubber" material for me. The iris continues to build even further as the scent develops, making it more and more powdery and less to my taste. Finally, amber adds a touch of sweetness to the iris/lavender combo to finish off the disappointing development. Sillage is average, and longevity is well above average. This one started off with a lot of promise with its uncommonly appealing lavender rendition, but in the end the iris ruined it for me and made it a mild thumbs down overall. I could see iris fans enjoying this scent plenty though, so please do try it if iris and lavender are notes you enjoy. In my case they are two of my least favorite notes, so the odds of me liking Gris Clair were low to begin with. Oh well. 2 stars out of 5. The smell of a rock under the sun, or of when ironing a clean cotton fabric. Beautiful lavender,a nice clean fragrance,cozy and warm.Big like.